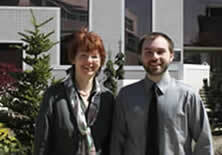 Congratulations to David L. Sellers who became an NSF Graduate Research Fellow. 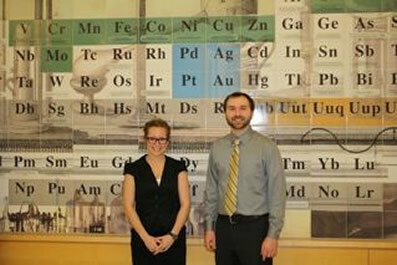 Congratulations to Rebecca Monterusso, the recipient of the 2012 Colonel Charles E. Bayliss Scholarship, and David Sellers, the recipient of the 2012 PECRAS Award (Program for Excellence in Chemical Research and Scholarship Award). David became a father on his birthday. Congratulations! Congratulations! Lars completed his Ph.D. work. Among others, he has prepared several new phenanthroline metal complexes and analyzed their crystal structures. Another aspect addressed the optoelectronic properties of specific derivatives in which the conjugated system of phenanthroline was extended. Lars also applied enzymes as reagents to prepare single phenanthroline stereoisomers via kinetic resolution, as seen below. 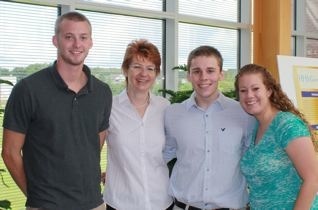 Lars is currently a postdoc with Prof. Randy Thummel and the University of Houston. 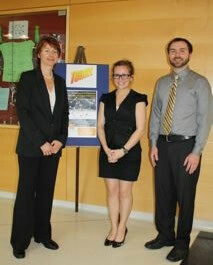 Elke Schoffers, Lars Kohler; "Efficient alcoholysis of 5,6-dihydro-1,10-phenanthroline-5,6-epoxide with ytterbium(III) triflate and subsequent enantioselective transesterification with lipases." Tetrahedron: Asymmetry, 2009, 20, 1897-1902. Lars Kohler, Elke Schoffers, Erin Driscoll, Matthias Zeller and Carla Schmiesing “First isolation of disubstituted cis-5,6-dihydro-1,10-phenanthrolines. Lipase-mediated resolution of cis and trans phenoxy alcohol isomers and assignment of absolute stereochemistry via CD and NMR” Chirality , 2012, 24 (3), 245-251. 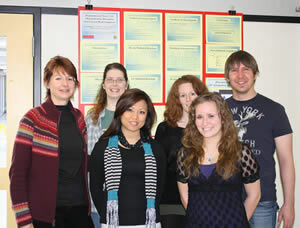 Toni's project focuses on measuring the acidity constants of 1,10-phenanthroline derivatives. The diimino moiety of the parent compound is very important for the interaction with metals. Once the B-ring is functionalized and the hybridization changed from sp2 to sp3, the N,C,C,N dihedral angle changes and, thus, affects the donor properties of each nitrogen. 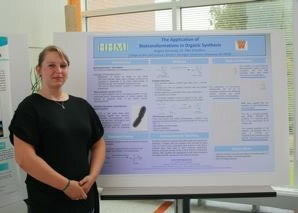 Rebecca is pursuing majors in Biochemistry and Spanish, and a minor in Women and Gender Studies. 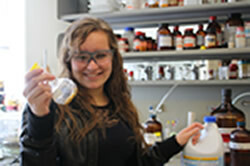 For her project, Rebecca is comparing the reactivity of 1,10-phenanthroline derivatives as free ligands versus that of their metal complexes. She is assessing the crude product obtained after using household bleach to make the epoxide below.